JAWS OF SATAN: A Late Show Combo-Horror Special – Schlockmania! It doesn’t take much ambition to rip off the story from one hit film. The real ambition lies in swiping key concepts from multiple movies at once. This is the course of action that Jaws Of Satan follows – and while the results fall into bad movie territory, the weirdness of how its purloined concepts collide gives it a certain fascination for fans of genre trainwrecks. Jaws Of Satan takes place in a little southern town where the big excitement is the upcoming opening of a dog racetrack. However, the impending bliss is threatened by a series of mysterious attacks by an intensely venomous snake. Local doctor Maggie Sheridan (Gretchen Corbett) is the first to grasp what is happening, aided by herpetologist Dr. Hendricks (Jon Korkes), but the town politicians try to hush them up. 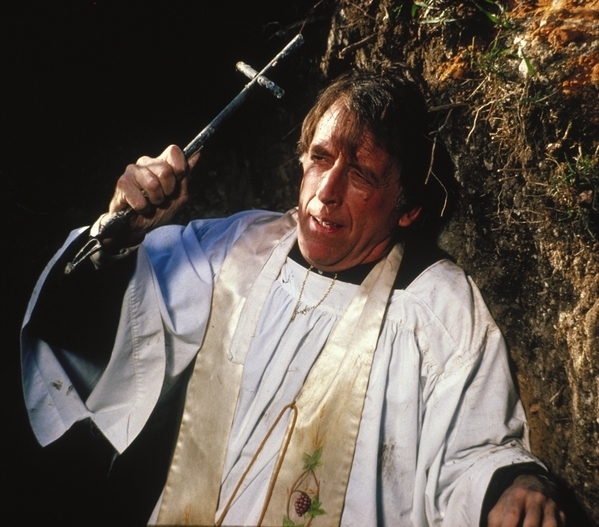 However, the ultimate key to stopping these attacks lies in the efforts of Father Tom Farrow (Fritz Weaver), who discovers that this snake might be the manifestation of an ancient evil tied to the town’s shady history. 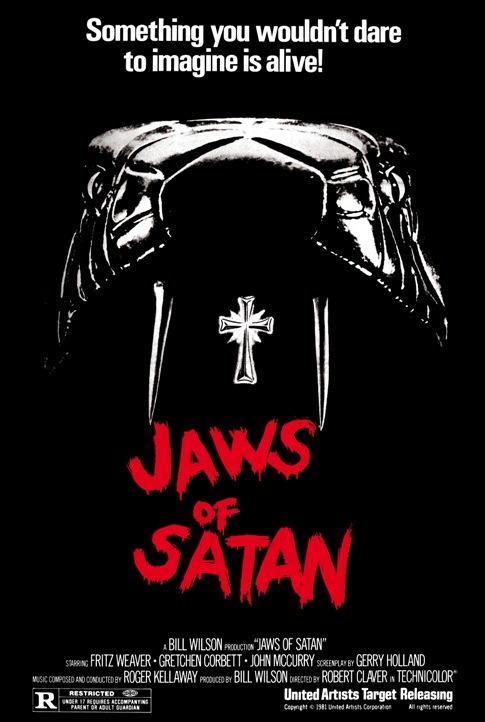 As the above synopsis hints, Jaws Of Satan is not content to be a mere snake-on-the-loose flick. It throws in a town conspiracy angle that comes directly from Jaws and really swings for the fences when it incorporates a supernatural evil angle that evokes The Exorcist. Gerry Holland’s script stitches these elements tog ether in an awkward way likely to inspire more laughs than chills. A great example of the eccentric storytelling is a bit where Sheridan finds herself trapped on a bed by a snake and calls Hendricks for help. The problem is he is across town so the scene involves the snake waiting patiently for several minutes while he races across town to rescue her. Jaws Of Satan also has flat direction from t.v. vet Bob Claver that emphasizes the story’s eccentric nature and unintentional humor by refusing to acknowledge what a weird mishmash it is. His humdrum direction tends to turn the snake attack scenes into self-parodies: a scene where a comic-relief cop hunts for a snake in a deserted store plays like an outtake from The Dukes Of Hazzard and a brief scene where the snake turns up at the local lovers’ lane ends in a way that will inspire a burst of laughter rather than a shiver. The booming, melodramatic score by Roger Kellaway in these moments painfully accentuates the lack of genuine horror. In fairness, the film does have a few solid elements: Weaver gives a likeably, surprisingly funny performance as the self-doubting priest and cinematographer Dean Cundey provides some well-lit, occasionally atmospheric camera setups when he isn’t being hampered by the direction. There’s also the novelty of seeing an elementary-school age Christina Applegate in her first film, fending off a snake in one of the better attack scenes. That said, Jaws Of Satan is more notable for its eccentricities and accidental humor content than anything else, making it perfect late-night fodder for the bad movie aficionados. 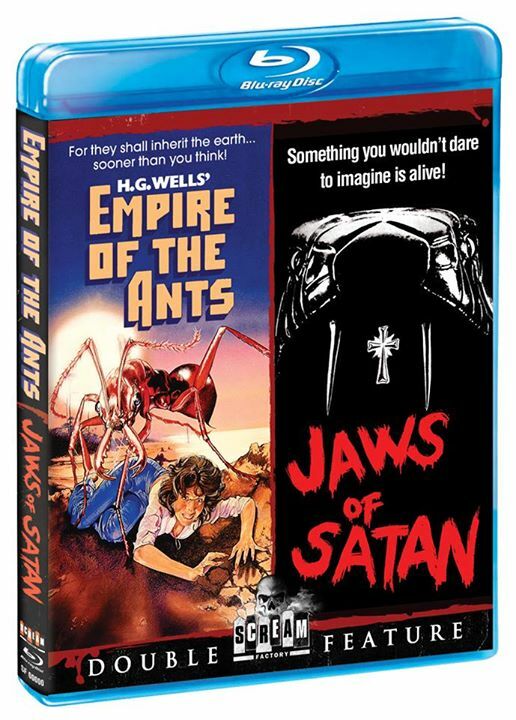 Blu-Ray Notes: Jaws Of Satan recently made its high-def debut on a double feature disc from Scream Factory, paired with Empire Of The Ants. The transfer looks nice, with good colors and a strong level of detail. The stereo audio is presented in DTS and offers a clear mix free of distortion. Extras for this film are limited to a trailer under the alternate title King Cobra but the addition of Empire Of The Ants and a few extras for that title make this disc a good deal for revenge-of-nature film fans.